One of our customers, Michael Duty of Precision Pressure Washing, in northern Florida, has been using our EATOILS™ BT200™ for removing oil stains from concrete and asphalt for years. He has found that there is a steady requirement for a contractor who can safely remove unsightly oil stains from all surfaces. His clients include restaurants, shopping malls, banks, condominium apartments, homeowners, municipalities, waste management companies and companies with hydraulic equipment. It is not unusual for Michael and his crew to be called out to remove a trail of leaked hydraulic fluid that stretches for over 10 miles through several neighborhoods. Recently, when he was working on a job for one of his customers, Michael came across a site where pervious concrete* was used. This product is primarily used in locations where there are rainwater issues and where rapid drainage is required. Unfortunately, like most other roadway surfaces, oil and grease stains can still be a problem. Using BT200™ is an environmentally friendly approach to eliminating oil and grease even in soil and pervious concrete. It is used extensively around the world for bio-remediating oil spills and for treating these contaminants in-situ - or where it sits - When you are working with soil or pervious concrete the EATOILS™ BT200™ actually bathes the surfaces of the individual pieces of aggregate and sand and removes the oil residue. Then the microbes in the product attach themselves to the oil and grease and break them down into water, carbon dioxide and oxygen. An initial spraying and brushing in of EATOILS™ BT200™ followed by a pressure washer rinse will remove all free oil and most of the visible stain. For the residual shadow a re-spray will fade most away over the next week or so. In difficult situations where the stain is old or excessively dark, several re-sprays a week or so apart may be required. The combination of time, EATOILS™ BT200™, warm temperatures and nature's rainwater will usually fade an oil stain from concrete in a few days (or 30-45 days for pavement). Without EATOILS™ BT200™ the oil stain will spread and cause environmental damage to the neighboring soil, and it can take many years (usually up to 100 years) for nature to eliminate the contamination. Hydrocarbons damage the integrity of asphalt or pavement by breaking down the bond between the aggregate and the oil-based binder, resulting in extensive repair costs - if you have paved surfaces that are regularly in contact with oil products you should use EATOILS™ BT200™ as an ongoing part of your maintenance program. 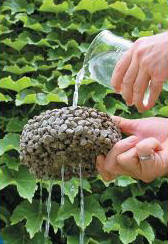 Pervious concrete pavement is a unique and effective means to address important environmental issues and support green, sustainable growth. By capturing stormwater and allowing it to seep into the ground, porous concrete is instrumental in recharging groundwater, reducing stormwater runoff, and meeting U.S. Environmental Protection Agency (EPA) stormwater regulations. In fact, the use of pervious concrete is among the Best Management Practices (BMPs) recommended by the EPA-- and by other agencies and geotechnical engineers across the country-- for the management of stormwater runoff on a regional and local basis. This pavement technology creates more efficient land use by eliminating the need for retention ponds, swales, and other stormwater management devices. In doing so, pervious concrete has the ability to lower overall project costs on a first-cost basis. 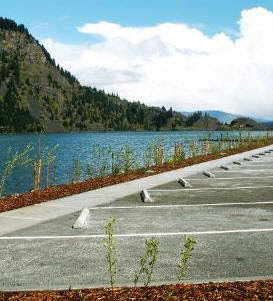 While pervious concrete can be used for a surprising number of applications, its primary use is in pavement. Pervious concrete, has also been referred to as porous concrete, permeable concrete, no-fines concrete, gap-graded concrete, and enhanced-porosity concrete.